Ladies and gentlemen, I present the most delicious vanilla cake I’ve ever made and eaten in my life. 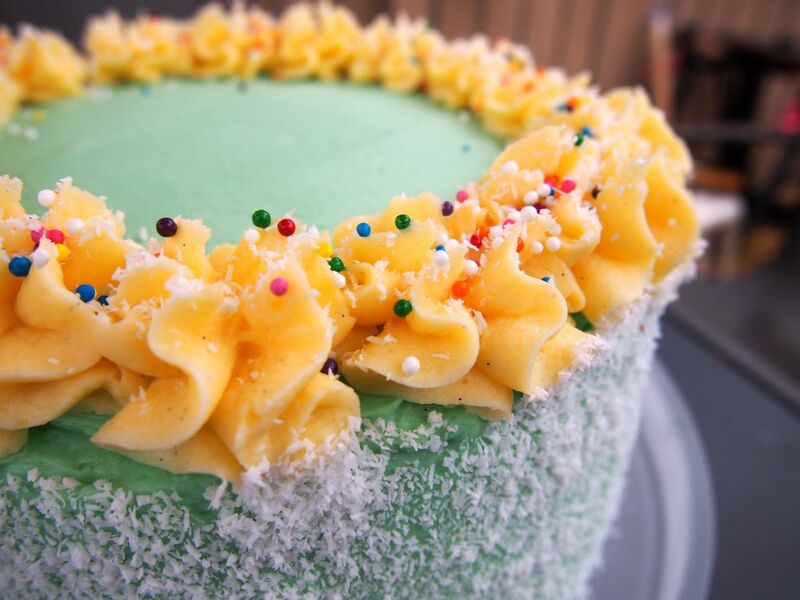 Yep, there’s the sprinkles. And I did a bad job masking the sides because the buttercream was too airy and I had bubbles everywhere. Solution? Cover it with unsweetened coconut! Want to know a disgusting secret? A deliciously disgusting secret? I used a tiny bit of butter extract in this cake. Everyone was losing their minds, going on and on about how good it was, and all I could think was “I’M A FRAUD, I’M A FRAUD OH MY GOD WHAT HAVE I DONE!?”. Sometimes you just have to use something sort of nasty to make something really delicious. It gave it this sort of…old-timey, classic, grandma-would-have-made-this sort of taste. I called it the “Vintage Vanilla Cake”. 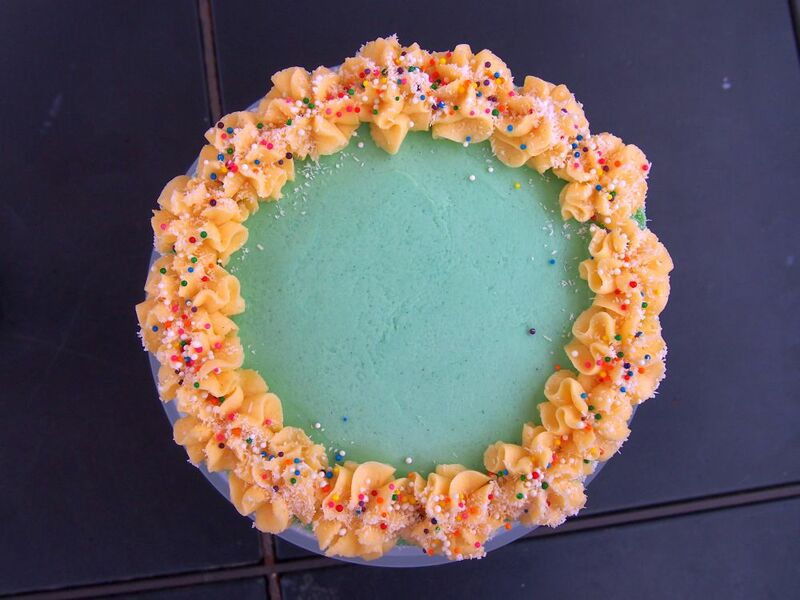 The blue/green buttercream and sprinkles helped with that feel. This cake made me feel nostalgic for things I’ve never experienced in my life because I’m not old enough to have done so. It made me think of sitting in a diner drinking milkshakes wearing a poodle skirt, and then a really cute boy with a pompadour winks at you and asks you to dance. Movies have led me to believe that that was a regular occurrence once upon a time. It should happen more often. I would really be okay with that. If you guessed this cake has 2lbs of butter in it total you would be right! Isn’t that awesome? 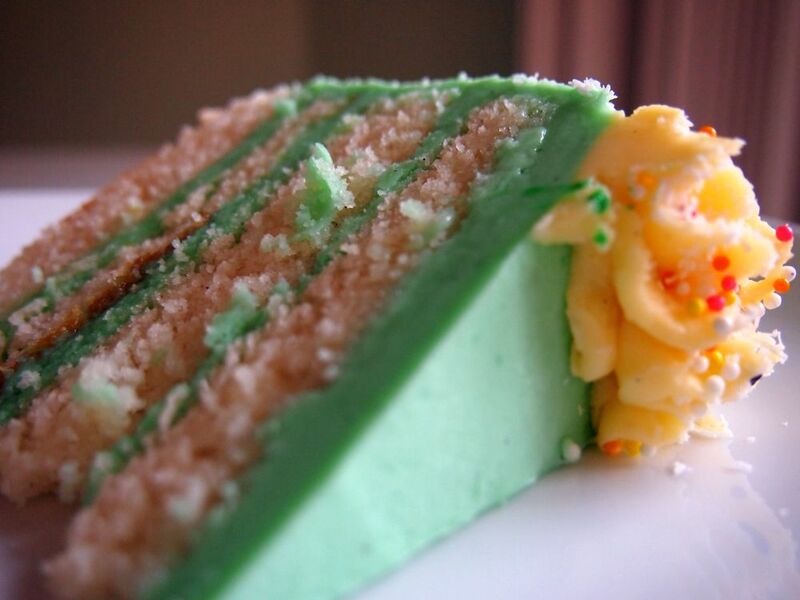 This entry was posted in Cake, Delicious things I think are pretty delicious and tagged baking, cake, sprinkles, vanilla, vanilla cake, vintage, vintage cake. Bookmark the permalink.